For the past several years, I’ve been wrestling through the practical implications of my faith in Christ. If I say I desire to glorify God and that He’s my greatest treasure, what effect will those declarations have on what I buy, how I spend my time, and what my goals are? While God has given me a lot of insight and I am more at peace about these things that I was before, I still struggle with feeling guilty for buying new clothes, spending 6 hours a week training instead of volunteering, and doing things I enjoy just for pleasure’s sake. “The eye is the lamp of the body. So, if your eye is healthy, your whole body will be full of light, but if your eye is bad, your whole body will be full of darkness. If then the light in you is darkness, how great is the darkness! “No one can serve two masters, for either he will hate the one and love the other, or he will be devoted to the one and despise the other. You cannot serve God and money. “Therefore I tell you, do not be anxious about your life, what you will eat or what you will drink, nor about your body, what you will put on. Is not life more than food, and the body more than clothing? Look at the birds of the air: they neither sow nor reap nor gather into barns, and yet your heavenly Father feeds them. Are you not of more value than they? And which of you by being anxious can add a single hour to his span of life? And why are you anxious about clothing? Consider the lilies of the field, how they grow; they neither toil nor spin, yet I tell you, Solomon in all his glory was not arrayed like one of these. But if God so clothes the grass of the field, which today is alive and tomorrow is thrown into the oven, will he not much more clothe you, O you of little faith? Therefore do not be anxious, saying, ‘What shall we eat?’ or ‘What shall we drink?’ or ‘What shall we wear?’ For the Gentiles seek after all these things, and your heavenly Father knows that you need them all. But seek first the kingdom of God and his righteousness, and all these things will be added to you. Set your mind on things that are above, not on things that are on earth. 1. God gave me these convictions – I didn’t come up with them on my own. Ever since I started to analyze my motives and why I do certain things and don’t do other things, God has been changing the way I look at the world. It started out as guilt from buying another $25 t-shirt that I didn’t need when that same money would buy food for a month for a kid over in Africa. It morphed into guilt from doing anything with my time that I alone enjoyed – I was convinced that that was the epitome of selfishness. I couldn’t escape the guilt. It was everywhere. A caramel macchiato from Starbuck’s. A pedicure. A good book. A nap. Anyone who knew me in college would not recognize the girl writing this post today. I am that different in my approach toward money. And God has shown me that this is His work in my life, refocusing my attention on things that are unseen and eternal, rather than things that are seen and transient. God gives us a vision, and then He takes us down to the valley to batter us into the shape of that vision. It is in the valley that so many of us give up and faint. Every God-given vision will become real if we will only have patience. Just think of the enormous amount of free time God has! He is never in a hurry. Yet we are always in such a frantic hurry. While still in the light of the glory of the vision, we go right out to do things, but the vision is not yet real in us. God has to take us into the valley and put us through fires and floods to batter us into shape, until we get to the point where He can trust us with the reality of the vision. Ever since God gave us the vision, He has been at work. He is getting us into the shape of the goal He has for us, and yet over and over again we try to escape from the Sculptor’s hand in an effort to batter ourselves into the shape of our own goal.The vision that God gives is not some unattainable castle in the sky, but a vision of what God wants you to be down here. Allow the Potter to put you on His wheel and whirl you around as He desires. Then as surely as God is God, and you are you, you will turn out as an exact likeness of the vision. But don’t lose heart in the process. If you have ever had a vision from God, you may try as you will to be satisfied on a lower level, but God will never allow it. It has been a long, hard struggle to get to where I am in accepting that God is in this. That God is calling me to a simple lifestyle and to give up caring about fashion, money, beauty, decorating, etc. 2. Sanctification looks differently for everyone. I have just recently realized this on an even deeper level. For so long, I had been frustrated with feeling guilty for shopping “just because” because I had a list of reasons why I believed I could shop in faith. We tithed every month, I wasn’t spending an extravagant amount of money, and the biggest one, I saw other Christian women doing it. If they could do it, why couldn’t I? A recent situation opened my eyes. There is a young married couple at our church whose wedding I attended. The toasts given by their families and friends all praised this couple for being very godly and strong in their faith. The time I had spent around them in a group setting seemed to agree with those assessments. I viewed this couple as two people who “had it together,” especially in their approach to money (which moved them up a notch in my book). Then I spent some time one-on-one with the woman and heard about their marital struggles, ones very common to young married couples. I realized that they were just human too. And that got me thinking… those women with the latest fashions at church – I don’t know what’s going on in their hearts. They very well might be able to buy new clothes in faith, but that also could be an area of their lives that God hasn’t yet refined and sanctified. All that to say, I can’t judge which of the Spirit’s promptings I’m going to follow or not based on what other people are doing. Oswald Chambers’ devotion for June 28 says, “At first, Jesus Christ through His Spirit has to restrain you from doing a great many things that may be perfectly right for everyone else but not right for you.” These things that I have been fighting may be perfectly right for others to do, but not me. I have to pay attention to my personal convictions. All this time, I had wanted to go back to the way things were before. I was rejecting this new way to live. Instead of viewing it as God’s invitation to me into greater, deeper joy resulting from letting go of materialism and my own assessment of What I Should Be Able to Do With Christian Freedom, I had been fighting it and thinking there was something wrong with me, since I was struggling with this and no one else was. But as I drove to work yesterday, I realized that in doing that, I was assuming that I should be “above that.” I should be above materialism and selfishly using my time for myself. Well guess what? I’m not. God wasn’t fooled for one moment either. He knew all along what I’m really like on the inside. The joke’s on me. 3. For me, buying new things should be the exception and not the rule. You remember my sandal post from a while back? I still haven’t bought any. I can’t decide which ones I want. Actually, I had decided which ones I wanted but then they were out of my size. Boo. I just don’t want to buy the wrong ones and then regret my decision. So I’m at a standstill on that one. My cousin is getting married on July 30th and I’ve been thinking about buying a new dress for the occasion. I might go peruse a thrift store to see if there’s anything good but otherwise, I feel like the best decision would be to wear a dress I already own – I have one that is great for summer weddings and I’ve only worn once or twice. 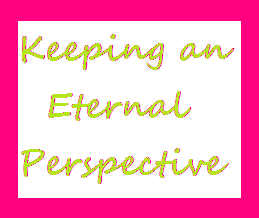 What does all of this have to do with keeping an eternal perspective? For me, the question underlying all of this is: Where does my happiness lie? Is my happiness wrapped up in having cute clothes? Or is it in knowing that Christ died for me and I’m going to heaven someday? Is not life more than food, and the body more than clothing? When I see a chunk of my paycheck every month going to our church, Campus Outreach, and our Compassion child, am I thankful to God for allowing me to participate in growing His kingdom? Or do I wish I could use that money to go on a trip to Hawaii? Christ didn’t say to store up treasures in heaven instead of on earth just because that’s a good thing to do, or because they really need more treasures up there. Instead, He said this: “For where your treasure is, there will your heart be also.” God knows our humanity. He knows that we focus on what we treasure. So He says, “Set your minds on things that are above, not on things that are on earth.” He wants us to keep an eternal perspective.